Ölüdeniz is famous for its deep blue waters, scenic views and beautiful weather year-round. It’s the kind of destination where you might go to relax for a week or two, and enjoy a much slower pace of life. And while you could easily spend two weeks in Ölüdeniz soaking up the sun and taking it (very) easy, it doesn’t mean there’s nothing else to do there. If you thought that was the case, I forgive you. Despite my excitement, I was a little apprehensive about visiting the Dalaman region of Turkey recently. I’d been there only once before – on a post-school exam trip to Marmaris fuelled by sun-seeking days and sleepless nights (and perhaps a few too many sugary cocktails). We were young, we were a group of 10 friends who had just walked out of the school gates for the last time ever, and it was the perfect place to celebrate that important rite of passage. But nearly a decade on… it’s definitely not my travel style. I have no problem with visiting touristy destinations but I was a little bit concerned that there would be little more to Marmaris and Ölüdeniz than bars, beaches and full English breakfasts. Thankfully, I was wrong. Very wrong. The Dalaman area of Turkey has changed a lot since I visited as a teenager. Just like me, it’s grown up a lot. Now, it’s the kind of destination that’s super popular with tourists yet still feels very raw thanks to its mountainous surroundings – an unusual combination that gives the area a very unique charm. If you want to get out and explore the local area, first of all: great choice. The Fethiye district in Turkey is one of the most naturally beautiful places you could visit. It has the perfect blend of history, nature and adventure for a relaxing yet exciting break. 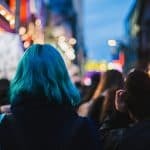 That means you can tailor your trip to your own travel style. I like a mixture of luxury, adventure and pretty photo spots, and Ölüdeniz and the wider Fethiye region certainly delivered on that front! There are enough things to do in Ölüdeniz to keep you occupied, but it’s worth venturing beyond the seaside to see some of Fethiye too. Whether you have one or two weeks in Ölüdeniz, or spend just a few days there before moving on to another nearby town such as Marmaris (like we did), these are some of the best Ölüdeniz excursions to enjoy. 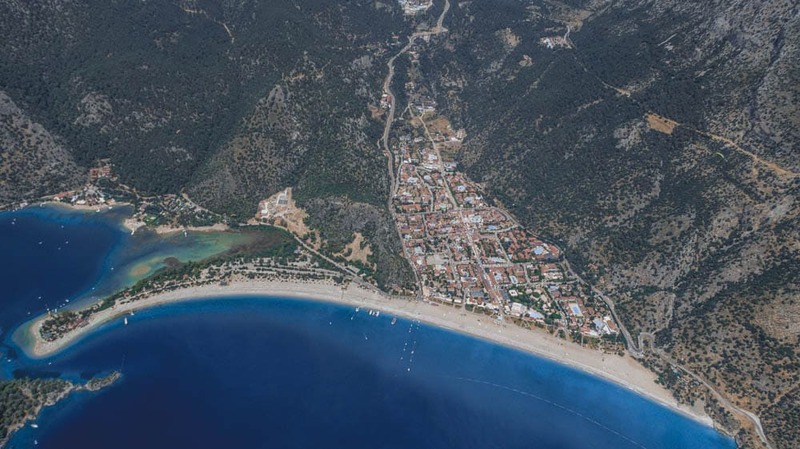 Whether you only have a few days in Ölüdeniz or just want to stay as close to your (temporary) home as possible, these Ölüdeniz excursions are all within walking distance of the main resort area. Let’s start out easy, shall we? No matter how long you stay in Ölüdeniz, there’s an almost certain chance that you’ll spend some time at Ölüdeniz beach. Even if you’re normally a beach kind of person, I guarantee you will appreciate this one – as far as beaches go, Ölüdeniz is pretty perfect. Sip a homemade lemonade on the sands, dodge the landing paragliders (more of that in a bit) and people watch all day long. Thanks to the south-facing location of Ölüdeniz beach, it also makes for a really beautiful sunset spot. The Blue Lagoon in Ölüdeniz lives up to its name. Tucked away at the end of Ölüdeniz beach is the famous Blue Lagoon. You’ll have to pay 7 Lira (around £1/$1.50) to get in and 15 Lira to rent a sunbed, but it will be well worth the small fee. Once inside, you can also rent a pedalo, kayak or snorkel in the vividly coloured sea. If you like to snap a load of postcard-perfect shots to take home with you, you’ll have no trouble filling your SD card here. 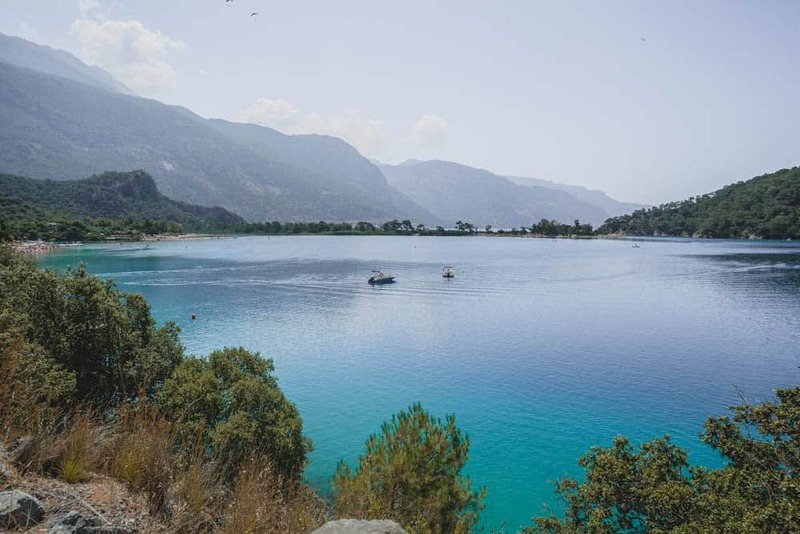 No trip to Ölüdeniz would be complete without at least half a day at the Blue Lagoon, so make a point of stopping by even if you fail to venture any further out of the area. If you want a completely different experience of the Blue Lagoon and Ölüdeniz beach, it’s time to hop on a bus. A short drive later and you’ll be near the top of Babadag mountain… and ready to jump off it. 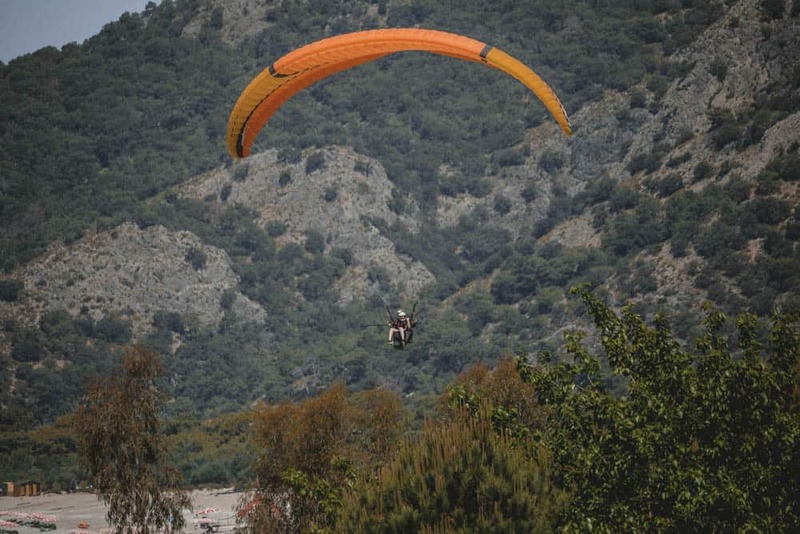 Ölüdeniz is just as famous for its paragliding as it is for the Blue Lagoon, if not more. It’s one of the best places in the world to enjoy the extreme sport, and there are four possible take-off points – the highest being 1.9km. Where you take off from will depend on the wind and weather conditions, and we ended up on the second-largest 1.8km-high point. Running off of a mountain was one of the craziest things I’ve done, and also one of the best. If you want to try paragliding for the first time, I think it will be hard to find a better place to do it than in Ölüdeniz. We went with Sky Star Paragliding and they told me that each pilot jumps around five times per day. Can you even imagine? I thought Travel Blogger was a pretty cool and crazy job, but these guys take it to a whole new level. A 3-hour tandem paragliding experience starts from £76 (around $101). Book your ticket here. The absolute best thing to do in Ölüdeniz? Take a mid-flight selfie while paragliding over the Blue Lagoon. 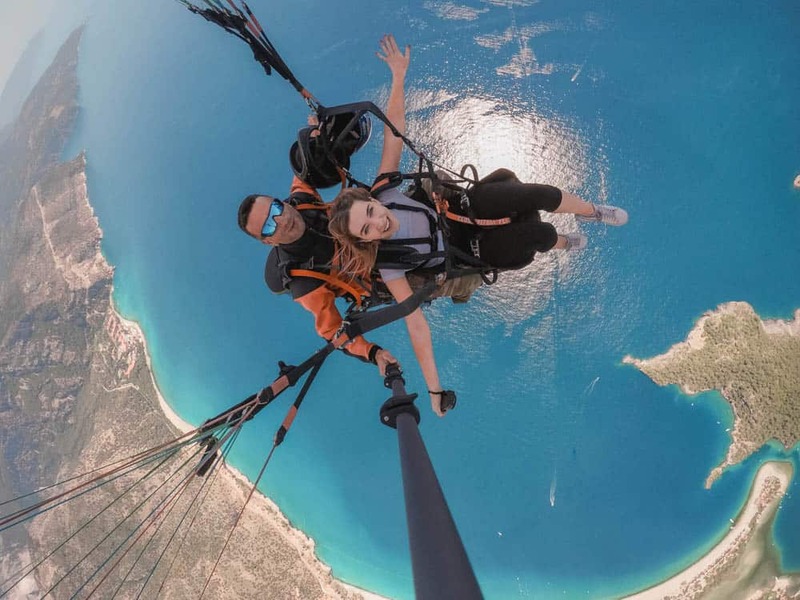 The length of the paragliding experience depends on whether you’re feeling brave enough to try some twists and turns, but will take around 25-40 minutes in total. That’s at least 25 whole minutes to enjoy the incredible views of Ölüdeniz beach, the Blue Lagoon and Butterfly Valley. Once you’re back on solid ground, you can buy a CD with videos and photos of the whole experience for a fee. Sadly, we didn’t have time to visit Butterfly Valley, a canyon famous for its butterflies, but I got a pretty good view of it from the sky. While floating around at 1,500m+, my tandem pilot told me it’s the best place to visit in Ölüdeniz, and I don’t doubt that because it sounds pretty magical. Butterfly Valley is only 8km from Ölüdeniz, but you can only access the beach by water. If you want to see this photogenic spot up close, it’s best to book on a boat trip excursion from Ölüdeniz. This full-day boat tour combines a trip to Butterfly Valley with a few other beautiful but hard to reach places near Ölüdeniz and also includes lunch. As beautiful as Ölüdeniz is (it was definitely my favourite town on the trip! ), don’t let it stop you from exploring the wider area. Ölüdeniz is a small village and the Fethiye district of Turkey has many of its own treasures to offer, so make sure you take at least one or two excursions out of Ölüdeniz while you’re there. Here are some of the best things to do in the wider district of Fethiye. The Fethiye fish market sits in a lively square, surrounded on every side by a number of restaurants waiting to cook the fish for you. 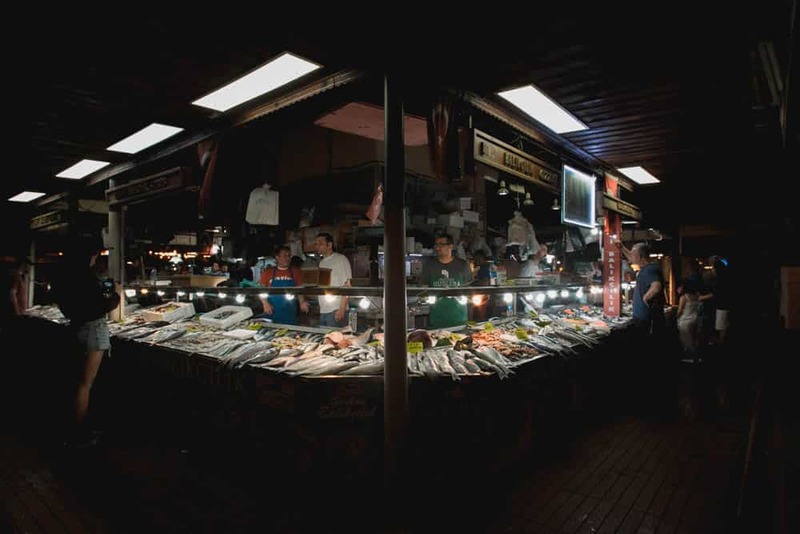 If you like seafood, an evening spent sampling the fresh catches is a must while staying in Fethiye. And if you don’t, you can try plenty of mezze (a selection of small local dishes) at the market too. Even if you’re staying in an all-inclusive hotel in Ölüdeniz, make at least one of your dinners a trip to the Fethiye fish market. It’s on the pricey side for the area, but don’t let that put you off. The number of locals dining alongside you will show how popular the market is with the residents of Fethiye – and for good reason. You don’t have to be a history lover to appreciate Kayaköy (or what’s left of it). 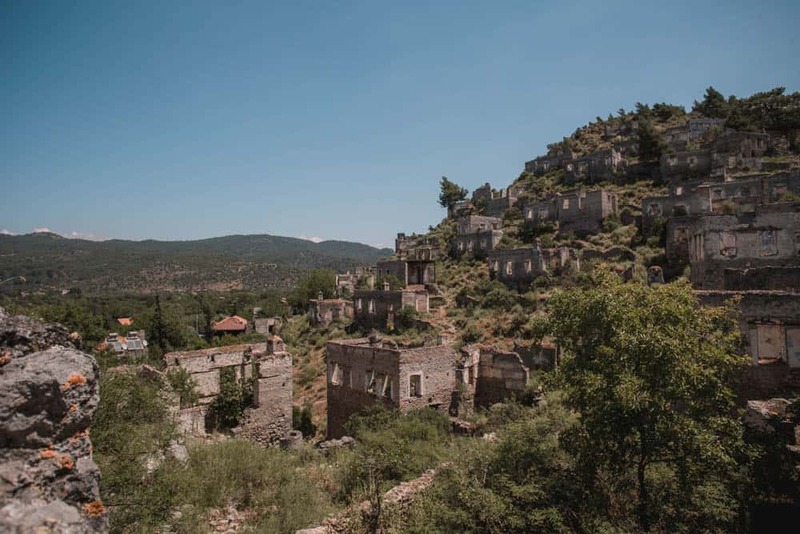 Once a thriving village where Greeks and Turks lived harmoniously together, Kayaköy was completely abandoned by the end of the Greco-Turkish war in 1922. Nowadays, Kayaköy is no more than crumbling buildings and an eerie reminder of the events that took place there. A half-house here, a deserted church there. The 500 or so houses that remain are under protection of the Turkish government. They’ve (apparently) announced plans to develop part of the village, but for now you can walk the village in its entirely ruinous state. Entry to Kayaköy costs 5TL (just under £1 or just over $1). 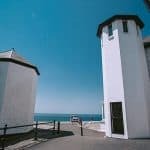 You can use the public minibuses and go by yourself, or combine with a day of exploring on a local tour of the area if you want to see some of the region’s highlights in one day. Taking a gulet cruise is one of the best ways to spend a day in the Fethiye region of Turkey. The 12 islands boat trip lasts all day and includes island-hopping around 12 islands off the Göcek coast. You’ll be able to watch stretches of scenic coastline pass from the comfort of the on-deck sunbeds, swim in one of the prettiest parts of the Mediterranean Sea and, if you’re lucky, you may even spot a turtle or two. The Göcek 12 islands boat trip costs £22.30 and includes lunch and drinks. If you want to combine a full-day boat tour with a trip to Butterfly Valley, you might prefer this boat tour from Ölüdeniz. Prefer to stay closer to home? Check out this shorter, 5-stop boat trip around the Blue Lagoon. We used the Liberty Hotel as a base for our Ölüdeniz excursions. It’s one of the top-rated hotels in Ölüdeniz and just a few minutes’ walk from the main beach promenade and the entrance to the Blue Lagoon. The Liberty hote is just off the main strip of bars and restaurants. The location means you have easy access when you fancy a drink or a bite to eat without all the noise when you’re trying to sleep. It’s the little extras that make a hotel stay special for me (after all, I do basically live in hotels!). The Liberty Hotel decorated my room with fresh flowers, a plate of Turkish snacks and fruit, and this swan display on the bed. It was almost too cute to sleep in! Read more reviews of the Liberty Hotel. Like most sunny destinations, you can wear pretty much whatever you want in the Dalaman region of Turkey. As it’s a popular tourist spot, you don’t need to worry about dressing conservatively unless you’re planning to visit other parts of Turkey too. A swimsuit. You can’t possibly visit such beautiful blue waters as those surrounding without taking a dip in them. 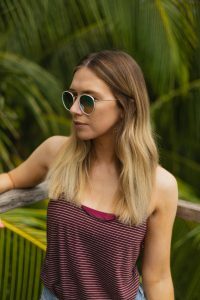 My swimsuit in the photo above is from Simply Beach, who always have a great range of reliable swimwear and beach accessories for all budgets (see below). Flip flops. The boat cruises were definitely the highlight of my week. You’ll want to spend at least a day or two cruising around the coast if you want to make the most of your time in Ölüdeniz. Slip-on shoes will be your go-to for boat days, beach days and even the Turkish mud baths. Walking shoes. Ölüdeniz is a great place to relax, but it’s also a fantastic place to get active! It’s one of the most popular paragliding spots for a reason but it sure gets windy up there, so make sure you pack a pair of sensible shoes. A GoPro. I always have a GoPro in my bag of blogging and vlogging gear. It’s SUPER useful for capturing both photos and video in wet conditions such as the sea and baths. The GoPro Hero 5 and 6 are already waterproof, but you’ll want to pack some underwater casing if you have a GoPro Hero 4 like me. 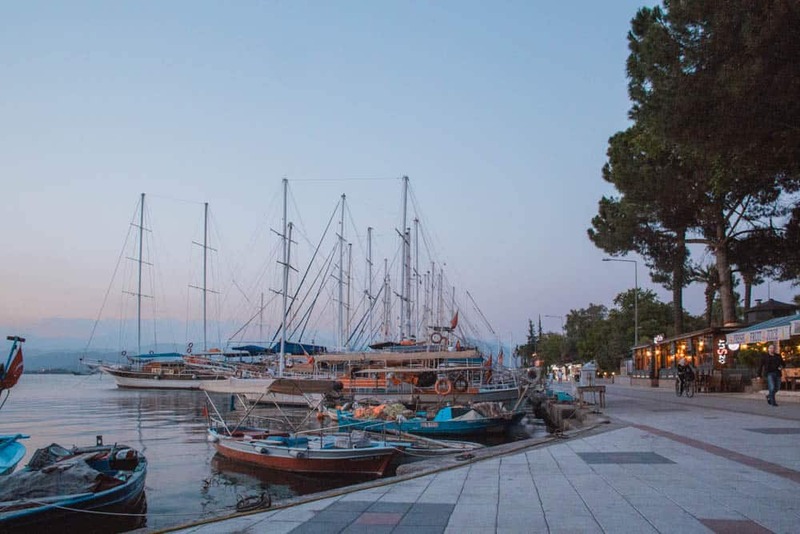 Our trip to Turkey was organised by Jet2, Jet2 Holidays and Dalaman Airport on a complimentary basis, but all views are my own and I definitely recommend this area of Turkey to anyone looking for a different kind of Mediterranean break.